Any type of move means one primary thing for your business: a decrease in productivity. Even if your organization needs to conduct an in-house move, the organization, preparation, and time that goes into that endeavor are substantial. With a highly-rated commercial in-house moving company, downtime decreases significantly, and your overall costs are lower. Many wonder why companies occasionally need commercial in-house moving teams to lend a hand. Whether your business is undergoing renovations, hosting a special event, moving to a new space in the same building, or decorating for the holidays, you are going to need some assistance moving everything around. Let Marathon Moving Company’s reliable, friendly, and diligent office furniture movers help. 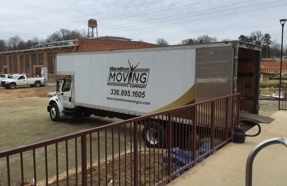 For those in the Triad area seeking the best commercial in-house moving services, contact Marathon Moving Company today. How long have you been in your office? When was the last time you moved heavy furniture and bulky appliances to clean and rearrange your commercial location? Has your organization added more employees or created new departments? Marathon’s office furniture movers are experts at redesigning workspaces. When our team of full-time, professional office furniture movers shows up, you’ll be amazed at quickly and efficiently they work to accomplish your goals and leave you with an office that functions better. Sure, you and your staff can take the time away from your actual jobs to rearrange your office. However, that’s going to cost you quite a bit of downtime. Plus, you don’t know how to expertly reconfigure an office for maximum efficacy. Luckily, we do! Invest in the best commercial in-house moving services the city of Greensboro, NC has to offer and call Marathon at 336-895-1605. We want to improve the feng shui in our office. Can your office furniture movers help us rearrange everything? Does Marathon assist with home staging? We need our furniture and large electronics moved for a special event. Can Marathon move everything one day and return the next to put it back? Do we need to supply any moving materials for our in-house move? Yes, Marathon Moving offers top quality, trustworthy in-house commercial moving professionals in and around Greensboro, NC who are available to assist with physically reorganizing the heavy items in any commercial facility. Whether it’s a few desks or every piece of furniture your enterprise owns, our team of office furniture movers will happily rearrange all of your large pieces until they perfectly meet your specifications. Absolutely! An essential part of selling a home is how it is staged. For realtors in the Greensboro, NC area, our in-home moving services make it simple to stage any home listed on the market. Leave the heavy lifting to our team of qualified movers and sit back while we stage your listing for you. Our commercial in-house moving team can meet any of your needs, including scheduling. Whether it’s a Christmas party or an educational seminar, don’t let bulky office furniture hinder your efforts. Let Marathon Moving clear a way for your business. It depends on the arrangements you make with Marathon when you schedule your in-house move. We absolutely can show up with all of the pads, blankets, furniture covers, dollies, carpet shields, floor runners, cargo straps, and hand trucks we’ll need to get the jump done. If you want to procure all of the items necessary for your move, our team will arrive and work with what you provide. Whatever works best for you!